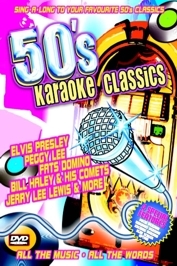 Sing a long to the greatest music of the last 50 years with AVID's latest karaoke series.....Karaoke Classics....the Decades! We begin in the 50's when rock n roll was king......and even the King was King!! We also feature all the rock n roll greats from The Crickets to Gene Vincent to the Killer...Jerry Lee Lewis. And just in case you wanted a little breather...we have included some classic ballads from Peggy Lee, Nat King Cole and Doris Day!